It seems like everyone is endorsing, writing or following some kind of diet plan these days. What prompted you to write Guided By Him, when there are already so many programs out there? Julie: I wanted to share a fun and easy way to lose weight--especially designed for busy people who overeat when they feel stressed out. I know personally that this program works. It helps overwhelmed overeaters lose the weight... and worries... that weigh them down. Guided By Him (GBH) is encouraging, inspiring and can be done in just a few minutes a day! You introduce 12 Steps for weight-loss in your book. Briefly describe the process and importance of these steps. Julie: In 1982, when I first read AA's 12 Steps, I knew they were the answer! I had been trying to figure out how to rely on God's power when I lacked willpower with my eating and the 12 Steps showed me how to do that. The 12 Steps were written by Christians over 70 years ago and have helped millions of people around the world to overcome their weaknesses. GBH steps are similar to AA's, but ours are shorter and they focus on Jesus helping us to quit overeating. You offer many practical tips, called Stepping Stones, to encourage participants to make intentional choices regarding food. Share a few of these with us. * A good way to decide how much a serving of meat is: look at a deck of cards. * Never eat while standing. * Make eating a meal a relaxing event (I'm finding that's really hard with a toddler!). * Brush your teeth frequently. It helps you reduce snacking. * As much as possible, stay away from foods that trigger your cravings (mine is peanut butter). * Chew gum or wear a mask if you're tempted to nibble while you're cooking. You're a mother/daughter duo. You both bring years of experience to the writing table. How did your careers help you in the writing process of Guided By Him? Julie: I am a wife, mother and new grandmother. I have been a secretary at the Pentagon, Spanish teacher, lay counselor, and RN. But the experience that helped me most in writing GBH was doing things WRONG for so many years, and then watching amazed as God helped me to change. I lost my extra pounds over 25 years ago and have kept them off. And God has changed my misery to ministry. I've been writing, speaking across the country and leading weight-loss groups since 1992. Sarah: I am a wife, new mother and Licensed Professional Counselor. I have counseled people from two to 92. I have worked a lot with overweight people who desperately need to lose weight, but are overwhelmed at the thought of doing it. I love teaching them new ways to deal with stress, facts about healthy living and easy things they can do to help them become more like the people they want to be. Sarah, how do you incorporate the principles in Guided by Him in your counseling ministry? Sarah: I use them in many ways. I teach my clients how to use Anger Busters, Victory Lists, and Prayer Journals. And I teach them the fun-filled food facts and fitness facts in GBH. I talk to my clients about how quitting their Stinkin' Thinkin' can change their behaviors. One example of Stinkin' Thinkin' might be: "I have already blown it today so I can eat anything I want." I encourage changing that to "Shrinkin' Thinkin': "I need to plan a healthy, filling meal tonight because I am starving!" When tempted to cheat on your healthy habits, what snack do you each reach for? Sarah: When I'm snacking, I try to balance carbs and proteins so my body stays balanced. And I drink a lot of water with lemon or lime slices. Because scripture is emphasized in this method of weight-loss, what is your favorite verse to use as a defense against overeating? Julie: There are so many! I guess my favorite is 1 Corinthians 10:13 "...God is faithful; he will not let you be tempted beyond what you can bear. But when you are tempted, he will also provide a way out so that you can stand up under it." For many years I thought the only way out of my temptation to overeat would be in heaven because I was sure that I'd always be tempted by unbearable food cravings while on earth. How do you reward yourself for achieving your goals? Julie: This sounds really goofy, but I'll tell you anyway. Every week, I tell my friend Sue how I have done with my eating, exercising and other goals (like not being grumpy). If I have achieved more than 80% of my goals, she gives me a pretty colored sticker. I love having a sticker on my Victory List each week. And I HATE having to tell Sue that I've done badly! But the biggest reward is that I feel so much better when I'm on track with my eating and exercising, and I really feel crummy when I'm not. Sarah: For my rewards, I make extra time for myself to give myself a manicure/pedicure or to watch a favorite TV show. Sometimes I do "Wal-Mart Therapy" where I buy $10 worth of things that I don't normally buy at the grocery store (shower gels, an unusual tropical fruit, a new nail polish). For moms out there trying to help their children to lose weight, what advice do you have for them? Sarah: I have a two-year-old so I am finding ways to reward him with things other than food. They include hugs and kisses (of course!) praising him when he obeys and Play-Dough time (his favorite reward right now). I think it is super important to keep kids active, limit TV, computer and game time. Those things are privileges--not requirements--for kids. Other advice to help your child lose weight: exercise and eat in a healthy way as a family. They will do what you do. No pressure! Read about their book here. Lose the Weight...Lose the Worry! (Birmingham, AL) - Does the idea of starting a diet make you hungry? Can you eat more than your children's combined weight in twinkies? Don't worry! Help is on the way. Author Julie Morris, RN, and her daughter, Sarah Morris Cherry, have developed a proven method for losing weight and keeping it off permanently. The Guided By Him method not only helps people lose weight, it also helps participants learn how to cope with stress. After years of struggling with her weight, Julie has developed a strategic, humor-filled plan designed to keep participants motivated, laughing, learning and yes, even eating. In Guided By Him, readers embark on an adventure in weight loss. Julie and Sarah use uplifting scriptures, thought-provoking questions, daily devotionals and fun-filled food facts to ensure readers keep a positive, light attitude toward learning a leaner lifestyle. Julie's experience as a nurse and Sarah's knowledge as a certified counselor, make this a pair of enthusiastic, highly qualified coaches. This study could be used alone in the comfort of home or led in a group setting. It's great for casual girlfriend meetings, church small groups and even the lunchroom at work! Accountability questions keep participants honest and real with themselves and others. How Can I Get This Mountain off of Me? I Have Let Myself Go. Is It Too Late to Get the Old ME Back? Julie Morris is a wife, mother, nurse, author and teacher. Since 8 years of age Julie has struggled to control her weight. That struggle of overeating, along with high blood pressure, sent her searching for a solution. After discovering the Christian 12 steps she began seeking God's guidance toward health and wholeness. Now, 25 years later, she's excited to share these tips with others. She is the founder of the Step Forward weight loss program. Guided by Him is a lighter, easier version of Step Forward, for today's busier lifestyles. Sarah Morris Cherry is a wife, new mother and Licensed Professional Counselor. She has counseled people from two to 92. Whatever the age, she enjoys teaching people new ways to deal with stress as well as facts for healthy living. She coaches them with simple things they can do to become more like the people they want to be. 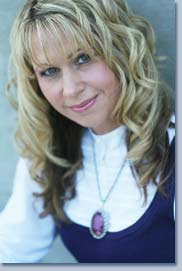 She speaks from experience, having overcome many overwhelming health problems by putting these concepts into practice. "I lost 40 pounds in 12 weeks while reading Guided By Him!" "I lost nine pounds in a Bible Study Group that used Guided By Him." "I loved leading the group! It was fun, easy and took very little preparation." Check out Authors Interview here. Leave a comment. If I receive 10 or more comments, a guest from my site comments will be eligible for a grand prize drawing for three of Julie's books: Guided By Him, From Worry to Worship and From Worthless to Worthy. Let me know in your comment what is your favorite healthy food or snack, etc. Be sure to leave a way for me to contact you if you are the winner. US residents only please. Drawing will be next Thursday, Feb. 12th. # 18 gkstratos' name will go into the grand drawing. Note: Become a follower of my blog or subscriber to blog (left column of my page) and you will get a chance to win also. Missy Jenkins shares her journey back to life as she survives the Heath High School shooting in 1997. Missy shares with her readers how one day can change your life. She thanks the Lord that on that day, Dec. 1, 1997, that Michael Carneal only changed her life and didn't take her life. Missy was 1 of 5 survivors; out of 8 shot on that day. For Missy her recovery was all in her attitude. Michael had thought out his shooting plan but didn't think out the consequences and how it would effect others or himself. He knew he would probably go to jail, but hadn't thought about how he'd change the lives of 8 others and their families and friends. He hadn't given any thought that he'd ruin lives. Missy found peace and forgiveness even before that first night, Dec. 1, ended. Michael may have dictated her life on Dec. 1, but he didn't have to dictate it every day after that. It was up to her how her life would turn out now. God had given Missy a second chance, however, now she had to live with the challenges of living life as a paraplegic. Being a paraplegic didn't mean life was over for Missy just things were going to be different. She was determined to have a normal life, but it would have to be in a wheelchair. She was thrust into a celebrity role not because of what she had accomplished, but because of what had happened to her. With hard work, faith and patience Missy has overcome many obstacles in her life. I'm sure if you read her story she'll give you courage to live life that God has given you in normal fashion whether normal or as a handicap. I was very much encouraged by Missy's story. Thanks for writing it Missy and may you touch many lives as to live your normal life. Q: Pirates and adventures on the high seas are topics you love to write about. What draws you to craft stories about these topics? A: Tall ships in the Age of Sail have always been a passion of mine-one that I gained early on as I grew up on the beaches of South Florida. I used to lie on the sand, listen to the waves lapping onshore, and dream of grand adventures on the sea. There is something romantic, yet dangerous, about the sea, and I admire the men and women who venture upon it seeking new lands, fortune, and adventure. No matter what story I formulate in my mind, it always tends to include at least one of those magnificent ships sailing the ocean blue. A: I've written my entire life. It's always been something I've enjoyed, but it was more of a hobby for many years than anything else. The very first time I sat down to write a novel that I intended to submit to a publishing house was four years ago after I had watched the first Pirates of the Caribbean movie with my daughter. I felt the Lord tugging on my to write a story about a Christian pirate-a man who had once been wicked and done vile things but who had given his life over to God. I had so much fun writing that book, but I still knew the odds were slim that I would ever see it in print. God had a different idea. Three months after I finished The Redemption, I was offered a 3-book contract from Barbour publishing. Q: In the Red Siren, the story of Faith Westcott is taken from the parable of Matthew 13 in which the farmer sowed a seed on rocky soil. When the plant came up, it was withered and scorched because it had no root. What are the foundations that are so important in order for us to develop a faith with roots? A: Great Question! I believe that biggest and most important foundation for a victorious Christian live is to know God. By knowing God, I mean to really know Who He is. To know His character, His desires, His sorrows, and most of all His love. And like any relationship, you cannot get to know someone unless you spend time with him. To know God should be our greatest desire. And we do this by reading His Word often, by praying without ceasing and by abiding in His presence. When we do things, despite our enemies' continual attempts to stop us, we will come to see how wonderful, how faithful, how glorious and how powerful our God is. But most of all, we will get a glimpse into how much He truly loves each one of us. Then when bad things happen as they did to Faith in The Red Siren, we won't fall away or become scorched by our trials. Why? Because we know that God loves us, and no matter how bleak things appear, He is working all things out for our good. Q: How do you thing God uses tragedies for goo in our lives? A: In answer to this question, allow me to give an example most of us can relate to-a parent. Suppose there were two little boys. One was raised by loving parents but in a family where there was no discipline. He was allowed every freedom possible and received everything he wanted. When he grew to manhood and left home, he had not learned to work hard and thus couldn't hold down a job. He had not learned to get along with others, so he had no friends. He had not learned to live without the things he coveted so he stole them and ended up spending his life in prison. The other boy grew up with loving parents who disciplined him. He was not given every freedom. In fact, he had to earn each freedom he received by proving that he could be trusted. Though it pained them, his parents allowed difficulties to come into his life to teach him the values of integrity, patience, honor and courage. When he grew to manhood and left home, he worked hard at his chosen profession, got married, had children and lived a happy, successful life. The moral of the story? God uses bad things in our lives to teach us to be more like Him and to become more effective for His Kingdom and, in essence, to have successful lives and be filled with joy! Q: In the book, Dajon struggles between doing good works for God and simply accepting God's grace. How has this been a struggle for you? A: When I became a Christian, I had spent years doing many bad things. Consequently, it was hard for me to accept God's complete forgiveness. I wanted to pay Him back by doing as many good deeds as I could: volunteering at church, visiting the sick in hospitals and tithing great amounts of money. None of those things made me feel any better about myself. In fact, they made me feel much worse as I looked around and saw others doing even more. The truth of the matter is, God's gift of forgiveness and salvation is free and undeserved and can never be paid back, no matter what we do. Getting that through my thick skull has been a challenge, but once I began to really understand, it changed my whole perspective on God. I no longer viewed Him as a gift giver I needed to repay, but as a gift giver I needed to worship. God has done it all, and I can do nothing except bow before His throne with eternal love and gratefulness and completely surrender my life to Him-, not because I'm trying to pay him back but because of who He is! Q: A character in the novel struggles to believe in the existence of God. What would you say to someone like him? A: I would say that God has made Himself evident in His creation and in our hearts and that He promises that if we seek Him with all our heart, we will find Him. My husband was a non-believer form many years and though I tried every Christian apologetic tactic on him to convince him of God's existence, nothing worked. One day, frustrated, I told him to find a spot where he could be alone and ask God to reveal Himself. So my husband went for a walk on a hill behind our house and did just that. And guess what? God showed up. In a big way, and my non-believing, scientist husband was really seeking. he really wanted to know God, and he was open to finding Him. God's Word is true. If we truly see Him and keep seeking Him, He will make Himself known. 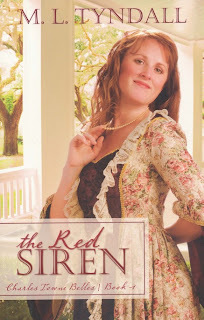 Q: Of the three sisters in The Red Siren, who do you relate to most and why? A: I'd like to say that I relate to Faith the most. She's independent, strong, confident, and courageous: everything I've wanted to be most of my life! Plus, who wouldn't want to try their hand at being a pirate? But, in all honesty, Hope is the sister I relate to the most. She's had a rough go of things. She's insecure, wounded and she's seeking more than anything to be valued and loved. She longs to be strong like Faith and to be pious like Grace, but she finds she can be neither. Though she knows about God, she doesn't value herself enough to think that god would give her a passing glance. So, she is easily drawn away from Him by the things of this world. This was my life before I came back to the Lord, so Hope's story "(The Blue Enchantress, summer 2009) is very dear to my heart. 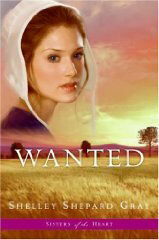 In wanted Katie Brenneman is struggling to find her way. During her Rumspringa years she thought she wanted to try out the English life, but ended up thinking better of it. She just wanted to have freedom and feel as if she belonged, but quickly found out English life wasn't who she really was. She then struggled with wanted to be wanted and loved by Jonathan Lundy, a widower, who had two young daughters. Jonathan and Katie have to come to terms with what it is that God wants for their lives. As we read this book you come to see that there are many characters that want things but is it really what God wants. What He wants is the best to have. Pretending to be something we aren't can only lead to disaster; We can only have true peace in our lives if do what He wants. Q - In just over five years, you’re putting out your sixth cookbook. How do you do this? A – I’m quite surprised myself, actually. But preparing foods, finding new combinations and flavors and influences, discovering new cooking techniques and more imaginative ways to entertain guests – these are all motivating passions to me. I believe in the old adage that “if you do what you love, you’ll never work another day in your life.” I love sharing my discoveries with people. Q – Lightens Up has taken you down a different path in kosher cooking. Why this book now? A – It’s been a maturation process on a couple of levels, really. Since the original Kosher by Design was published in 2003, I’ve certainly grown as a home cook and my kids have grown. I was looking to do better by them and so I began investigating and experimenting with healthier foods and cooking methods. Lightens Up is the result. Q – So how is it different? Q – One of the signature features in your previous cookbooks has been rather tasty international influences. Does that carry through in Lightens Up? A – Most definitely. Lightens Up can take you around the world. Off the top of my head I can mention an Argentinean Bison Steak, Korean Beef Kim Chee Skewers, Merquez Sausage on Whole Wheat Couscous, Chicken Tikka Masala, Lebanese Salad, Greek Farro Salad, Mexican Citrus Salad, Thai Chicken Soup, Moroccan Spiced Vegetables, Japanese Udon Noodle Soup, a Greek Fritta Ring, and Tangy Mediterranean Vegetables. There’s a lot more and besides tasting great, it’s all very healthy. Q – You didn’t mention any desserts on that list. Are they out? A – You’ll be quite surprised here. There are 21 in Lightens Up and they’re all fabulous. I’m thinking now about the Apple-Blueberry Cake, the Peach-Berry Tart, Baklava Bites, a Frozen Pumpkin Pie – there’s even a Banana-Chocolate Strudel. Q – Were there any surprises for you personally in putting Lightens Up together? A – I was certainly delighted that my family and friends found these recipes so good. I’ve learned to enjoy some new foods that I hadn’t known much before, such as wheat berries and faro, which is a very nutritious ancient Middle Eastern grain that’s becoming popular. As I’ve incorporated more whole grains into meals and reduced the amount of fats, sugars, and oils in my recipes, I’ve found the flavors to be refreshingly pure and satisfying. Also, we discovered some really fun and unique entertaining ideas, such as an olive oil tasting party and a fruit spritzer bar. Read meet the author here. Susie Fishbein is an everyday cook who loves to share her passion for cooking and entertaining. Her contagious enthusiasm for food and entertaining led to the creation of the best-selling cookbooks, Kosher by Design (2003), Kosher by Design Entertains (2004), Kosher by Design — Kids in the Kitchen (2005), Kosher by Design — Short on Time (2006), and Passover by Design (2008). Altogether, her first five books have sold over 300,000 copies. 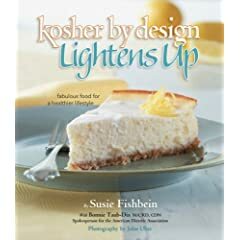 Her latest in the series is KOSHER BY DESIGN LIGHTENS UP (Nov. 2008). 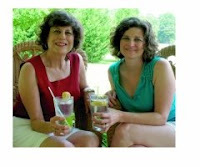 In addition to being a successful cookbook author, Susie is also a wife and the mother of three daughters and one son. She holds a Master’s Degree in Elementary Education with a specialty in Science Education. Susie travels the country sharing recipes and techniques through book signings and cooking demonstrations. She has appeared on numerous television shows such as The Today Show, Living It Up with Ali & Jack, and Sheila Bridges: Designer Living, as well as an appearance on Martha Stewart Radio. Susie has done food segments on several network news programs nationwide. She taught at the prestigious Degustibus School of Cooking, at the Viking Culinary Centers, and on Chosen Voyage and Kosherica cruise lines. Susie and her cookbooks have been featured in the New York Times, the Associated Press and numerous newspapers across the country. 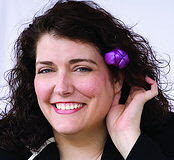 In 2005, Susie was appointed Official Spokesperson for Manischewitz Foods and was a popular presenter at the Epcot Center International Food and Wine Show in Orlando, FL in November 2006. In 2008, she was named Woman of the Year by the Westhampton Beach area Pioneer Chapter of the Hadassah Women’s organization. I was absolutely delighted when asked to review this cookbook. I had never reviewed a cookbook before. First time for everything. Didn't know what to expect. 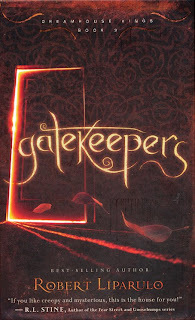 This book is just wonderful. I have a list of recipes that my family wants to try, but I just couldn't wait to post my review. However, we have tired two recipes so far in this book and they are delicious. We tired the Spicy fries and the Peanut Butter Pizza; yes, there are desserts in the book. This book is a nice hardback book. At the beginning of the book there are pages of very helpful information; such as - The Kosher Kitchen, will give you tips on setting up your kitchen. Then there is the Lighten Up page, which will get you thinking about how to cook lightly,(no it doesn't help you not to burn the food) There are two pages of Supermarket Savvy tips. Several pages of definitions so you know exactly what a word means. There's a superfoods page and a page with Tasty Tidbits page, even a whole page concerning flour and a page on grains, oils, sugars, seeds and nuts. A page with gadgets for health cooking what to have. Then there is the ideas section: This section will give you entertaining tips. It is crammed full of goodies. Each recipe has a description or information on why something in that recipe is used. (ex: from the House Salad recipe: Says, "With all the fancy salads I know how to make, when my sister, mom, and I get together we always pull together this salad. My Grandma Mollie was the original creator of the dressing, which she would whip up at every holiday. You can toss anything into this salad, including carrots, snap peas, and olives. I use a hand-held mandolin for the cucumbers and red onions to get them paper-thin. Remember, the darker the greens the greater the nutrient value.) The recipe is then to follow after some information. The layout of each page is very clean and neat with the all ingredients in a column so you can quickly take note of what you need for the recipe. Each recipe also has a picture of what the finished product should look like. Many are a full page, beautiful and colorful and very helpful to some cooks. 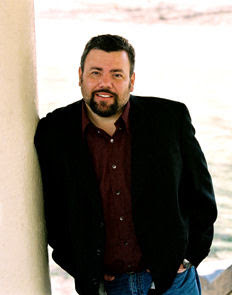 Davis Bunn is an internationally acclaimed author who has sold more than six million books in fifteen languages. His audiences span reading genres from high drama and action thrillers to heartwarming relationship stories, in both contemporary and historical settings. Honored with three Christy Awards for excellence in historical and suspense fiction, his bestsellers include My Soul To Keep, and Full Circle. A sought-after lecturer in the art of writing, Bunn was named Novelist in Residence at Regent's Park College, Oxford University. Her first novel, a prairie love story titled Love Comes Softly, was published by Bethany House in 1979. This book was followed by more than 75 others. She and her husband live nearby in Alberta, Canada. 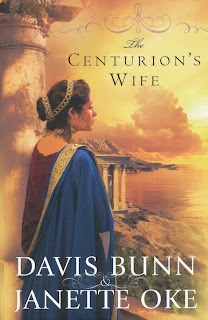 Caught up in the maelstrom following the death of an obscure rabbi in the Roman backwater of first-century Palestine, Leah finds herself also engulfed in her own turmoil--facing the prospect of an arranged marriage to a Roman soldier, Alban, who seems to care for nothing but his own ambitions. Head of the garrison near Galilee, he has been assigned by Palestine's governor to ferret out the truth behind rumors of a political execution gone awry. Leah's mistress, the governor's wife, secretly commissions Leah also to discover what really has become of this man whose death--and missing body--is causing such furor. This epic drama is threaded with the tale of an unlikely romance and framed with dangers and betrayals from unexpected sources. At its core, the story unfolds the testing of loyalties--between two young people whose inner searchings they cannot express, between their irreconcilable heritages, and ultimately between their humanity and the Divine they yearn to encounter. A nuclear bomb pretty much assures instant death—one second you’re here, the next kablooey. Quick and painless. Unlike Washington bureaucrats, the average American doesn’t spend a whole lot of time thinking about weapons of mass destruction. I certainly don’t detect a high level of fear in anyone I know. Other than the garden variety conceal-n-carry discussions, weapons really aren’t on anyone’s mind. I suppose if you lived in war torn Iraq or some drug-cartel, gang-infested country, you would be afraid. And rightly so. Or if you lived during the Dark Ages. Peasants didn’t get to wield halberds or maces. Oh, they might have a pitchfork handy to threaten some nasty puncture wounds. Likely they’d tote a knife which, granted, can inflict a mortal wound if handled properly. But the gnarliest weapons belonged to knights and nobles…instilling fear into the plebian sort. Let’s say you’re a resourceful peasant who copped a sword off the black market for an amazingly low price. End of fear factor, right? Wrong. Some knights carried a Sword Breaker. This is a unique weapon developed and used during the Middle Ages. It’s pretty much a long, sturdy dagger but with one major difference—slots on one side, kind of like the teeth on a comb. A Sword Breaker was used to capture an opponent’s blade. Once caught, a quick twist would snap the enemy’s blade, effectively disarming him. Speaking of daggers, ever hear of a Rondel? This puppy inflicted some serious damage. A Rondel is a long, conical-shaped dagger made specifically for piercing armor. And once through the armor and the flesh beneath, a gaping hole the size of Pittsburgh pretty much insured death. But both of these aforementioned items would require your enemy to be on foot, not mounted up high. Problem: how to unseat a skilled horseman. Solution: a landmine. Yes, a landmine. Oh, not the type in use today but efficient nonetheless. The Caltrop is an example of the ingenuity of the times. Much like a mongo version of a child’s jack, a Caltrop is a fabrication of metal with four sharp points. Thrown on the ground, it always landed with a point sticking up. Scatter a bunch of these babies on the ground and the oncoming cavalry would have some serious issues to deal with. But even common items can do unspeakable damage. In my book, Gallimore, I allude to the death of Edward II. Consensus says he was murdered, but the story behind the murder might make you cringe. You should know this about ol’ Ed…he wasn’t a favorite king. He didn’t endear himself to the people and especially not to his wife. Most queens are hardly amused when the king not only partakes in dalliances on the side, but ones wherein they can’t compete, well… You see, Edward had a bit of an attraction to the same gender. This special quality of his ticked off a lot of people, tolerance not being in vogue at the time. They tried the usual imprisonment and starving. Even subjected him to filthy water in hopes he’d succumb to disease. Nope. Edward II was a hearty soul. So, one wicked eve during his enforced visit to Berkeley Castle, several men gathered to perform a dastardly deed. As Edward lay asleep, they squished him down with a table, intending to squash the air from him and suffocate the little fella. Foiled again. He wriggled like a minnow out of water, flipping himself over on his tummy. Who came up with the idea of a hearth poker we may never know, but someone did. They heated the rod up until it glowed red, then shoved it up his…well, let’s just say Edward became a kabob from the bottom up. Technology will forever be developing newer, mind boggling weapons. However, just because they’re fancy does not make them any more frightening than the weapons of the past. Hmm. Kind of makes one wonder…maybe it’s the people behind the weapons we should fear most. Who is Michelle find out more here. Well this interview is going to wrap up our week with Michelle. It has been a pleasure having her visit the site. If you missed any day this week just scroll down or look in the side bar archives I've had guest articles and interviews and all with Michelle all week. Or click here to go to Monday's article and a schedule of articles with links. Michelle, what fiction character you would most like to be or most identify with and why? I always wanted to be Lt. Uhura on Star Trek because her uniform is pretty sweet, she gets to wear a funky ear piece, and she never had a bad hair day in her life. My family is a Star Treky fan too. Have watched many a series. If you could ask any person, living or dead, a random question -- what question would you ask of whom? I’d ask Mr. Rogers about the whole sweater and sneaker attire…was that really your idea or your mother’s? Good question. Guess we'll never know the secret went to his grave. What crayon in the box describes you on a good day? Bad day? Which one do you aspire to be? I’m a marker girl myself, so I’m not really up on crayon colors. I always loved coloring when my girls were little. Markers always bled through and ruined the other page and sometimes pages. If you were assured of writing a best-seller, what genre would it be? Give us a sliver of information, a characteristic or glimpse of a scene. Time travel – I love to throw myself into history, and of course I’m always the heroine. Naturally there’d be an unbelievably muscular hero who’s a warrior with a big heart that’s completely devoted to the heroine. And sorry, Fabio would NOT be on the cover. Time travel is pretty cool. I love history novels. What period of history intrigues you the most? Your Medieval was one of my first. It was really good. I'm glad I was able to review it. How does something worm its way into your heart? Through tears, truth, humor or other? Time – I’m a slow learner. I have to do things more than once to get it so guess I'm a slow learner too. What book, music, person, food you would take with you on a very long trip. Isn't chocolate a must in everyone's food diet. Where would you most like to travel ----- moon, north pole, deep seas, deserted island, the holy land or back to a place from your childhood, somewhere else? – and why. England. I’m an Anglophile at heart. I'd love to go to England or Ireland. Castles intrigue me. Which is your favorite season and why? Autumn because of the amazing colors and the fact that hot chocolate is once again in season. I love autumn for its color show too. I think God likes colors too. It was He who created them. What is your favorite book setting and why? Jane Eyre when she’s walking the misty moor and Rochester appears on a rearing horse. That’s how God most often works in my life. I’m usually walking around in a daze and bam! He appears. Sometimes it takes that to get our attention. Which compliment related to your writing has meant the most and why? Actually, I try hard to ignore compliments and criticism (mean-spirited, anyway) because I don’t want to get a big head, nor do I want to have my heart pierced. You have to have broad shoulders and tough skin. What would you do today if you knew you had only a week to live? Eat lots of chocolate, drink lots of coffee, and tell lots of people about Jesus. Wait a minute…I do that anyway. Why of course. What is your favorite word? Ok. What word annoys you more than any other? Good word. Superhero you most admire and why? Underdog. What’s not to love about a pup in a cape? Now I haven't heard of him in sometime. What super power you'd love to borrow for awhile? Oh, yes, that would be fun to be invisible. do you have a favorite chore? I'd rather stay out of the kitchen, but I can't. opps I wasn't suppose to say can't. Is there anything you'd do but don't because of fear of pain? What is it? Ex. Bungee jumping, sky diving, running with scissors. I'd have a hard time with them too. Do you have a grammatical pet peeve? Just say no to sentence diagramming. Now, I've enjoyed learning to diagram sentences with my girls. I home school my two girls too as your bio said you've homeschooled four kids. Actually, my oldest graduates in May. I want to thank you Michelle for all that you've supplied me with to put on my blog this week. I hope my readers have learned who you are and will want to go out and get your book. Thanks for the interview. Find out more about Michelle with link below. Who is Michelle? Learn more here. A story of new beginnings from best-selling Romance for Good™ author Denise Hunter. When Josephine's family insists she come home to help with the harvest, the timing works. But her return isn't simple benevolence-she plans to persuade the family to sell the failing orchard. The new manager's presence is making it difficult. Grady MacKenzie takes an immediate disliking to Josephine and becomes outright cantankerous when she tries talking her family into selling. As she and Grady work side by side in the orchard, she begins to appreciate his devotion and quiet faith. She senses a vulnerability in him that makes her want to delve deeper, but there's no point letting her heart have its way-he's tied to the orchard, and she could never stay there. A brush with death tears down Josephine's defenses and for the first time in her life, she feels freedom-freedom from the heavy burden of guilt, freedom to live her life the way it was intended, with a heart full of love. 5. A prime-time CSI type lackey for collection of DNA or evidence planting. With talons, intelligence and wicked sharp beaks, a raven can plant evidence or borrow evidence. Creativity is required here. If your Stunningly Great American Novel is set in a historical setting, DNA is a moot point. However, never overlook the possible inclusion of an evil wizard or psychotic bad guy to need to collect a lock of hair or a strip of skin. 4. Eye candy. Literally. Okay, this is gross, so close your eyes o' squeamish ones. Ready? Here goes. Carrion birds consider eyes a great delicacy and believe in eating dessert first, if you get my drift. 3. Nothing like a soaring black bird with a wing span equaling the height of a child. Yes. Edgy. 2. Swooping and terrorizing. Do I need to say more? Obviously the bird likes eyes, has an amazing wingspan and can collect DNA. Think about the implications. And Red Riding Hood thought that the wolf was a fright. And the number one use of a fictional raven: Stalking. Two glossy beady eyes. Awesome sight and smell skills. That's what I'm talking about. 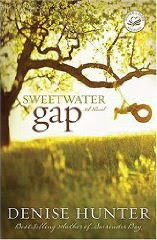 The above was inspired by Michelle M. Griep's novel Gallimore. For those of you who are interested in raven antics as specified above, you'll find much satisfaction should you crack open the book. Trust me. Michelle went right for the big dog bird...no prissy little humming or songbirds for her. Find out more about Michelle Griep here. I’m taking a vacation from time-travel and visiting the land of cozy mysteries…and this time I’m taking along someone to help carry the luggage. A writer buddy of mine—you may have heard of her, Kelly Klepfer—and I are co-conspirators of Out of the Frying Pan. Shameless but brief blurb: Murder in Paradise whips life into a froth. Zula and Fern Hopkins, sisters-in-law, grudging roommates, and sometimes friends reside in Sunset Paradise retirement community. Their escapades land them in hot water when they attempt to sniff out a murderer. The added ingredient of a handsome, young detective who’d make a fine main-dish for their niece spices up the action even more. Tell us about your journey to publication. How long had you been writing before you got the call you had a contract, how you heard and what went through your head? I didn’t actually get a call. It was an e-mail. I’d been a closet-writer since 2000. The first manuscript I wrote is so incredibly horrible, I use it as an example of what-not-to-do in a Creative Writing class I teach. I finished my second manuscript, Gallimore, in 2005. I shopped it around a bit, then edited and re-edited until there was no more red ink in my pen. I sold it to Black Lyon, Spring ’08. I’m pretty sure the stunned disbelief that charged through me fried a few thousand brain cells, but with a little counseling, I’ll be fine. I’ve recently had an incredible epiphany—agents and editors are…drum roll please… human. All the palpitations, sweaty palms, and acid reflux I endured when even thinking of talking to an agent or editor was a complete waste of time and Pepto Bismol. Do yourself a favor and take them off the pedestal. They don’t belong there. WORST: When you get a rejection, slap on some red lipstick and kiss it good-bye, which is a bad idea unless you use lipliner first…makes the edges much more defined. One day I’d love to be able to have the time to write more than one night a week. Currently, that’s my allotment. I’m happy to have it, but I wouldn’t mind more. 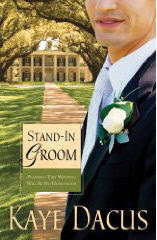 FAVORITE: Working out my own theological questions and dilemmas in the lives of my characters. LEAST FAVORITE: Writing a synopsis—I’d rather cough up a hairball. Write for the enjoyment of playing with one of God’s great blessings to us—words. If you’re writing from your heart, and it’s a heart centered on God (not publication), you will glorify your creator. That’s what writing is all about.